ItemI-00978 - Northwestern Creamery Trucks, Victoria. ItemI-00980 - Northwestern Creamery Bottling Milk, Victoria. ItemI-00981 - Northwestern Creamery Ice Cream Plant, Victoria. ItemI-01336 - BC Electric window display, "BC Electric Presents the Trolley Coach; The Modern Electric Carrier; Silent; Modern". ItemI-01446 - Victoria; Unloading Cans Of Fresh Milk At The Northwestern Creamery. ItemI-01474 - Milk Plant; Northwestern Creamery, Victoria. ItemI-01522 - Yarrows Ltd., No. 1 yard, Victoria. ItemI-01523 - Yarrows Ltd., No. 1 yard, Victoria. Item I-01336 - BC Electric window display, "BC Electric Presents the Trolley Coach; The Modern Electric Carrier; Silent; Modern". 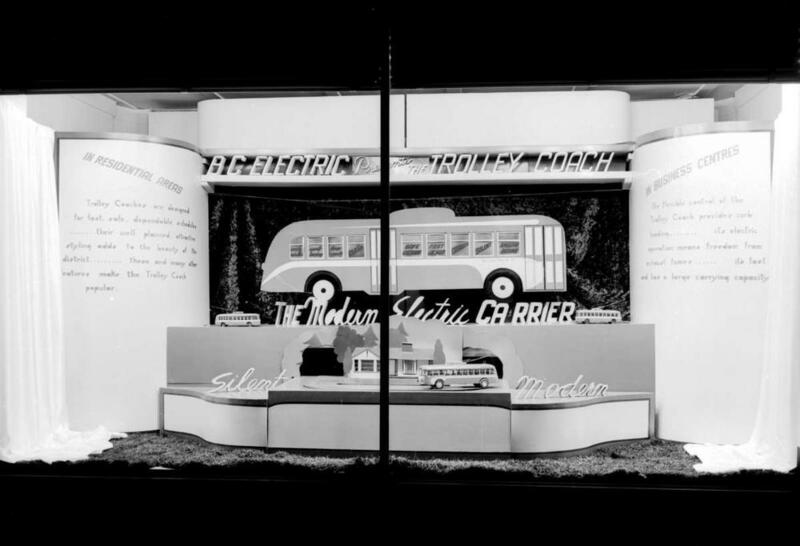 BC Electric window display, "BC Electric Presents the Trolley Coach; The Modern Electric Carrier; Silent; Modern".